"In real terms, the National index is back to Q4 1999 levels, the Composite 20 index is back to August 2000, and the CoreLogic index back to March 2000. In real terms, all appreciation in the last decade is gone." Interesting post. 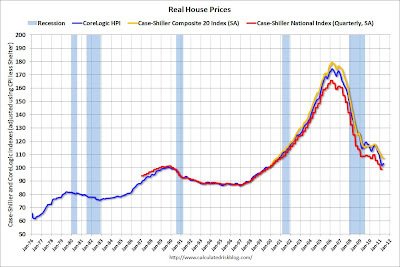 The problem is that in U.S., we have huge existing home inventories. While these inventories still exist, there is no way that the economy recovers. Here is the relevant graph, showing huge inventory growth. I wonder if this is a good buying opportunity or the market will stay flat for some time ahead. I guess, before companies start hiring again, business and corporations increasing production, it is unlikely that individuals start purchasing houses. However, how can companies produce more if there is no one to buy their goods and services? Unless, we have some kind of new invention, some new economic development, we are unlikely to see rebound in the economy and/or real estate.